Here are 9 tips about traveling in China during the Spring Festival 春节( chūn jié），the Chinese meaning of this festival is Guo Nian （过年 guò nián）just like Christmas in the West. Weather everywhere, make sure you prioritize wool sweaters 羊毛衫 (yáng máo shān）, down coats羽绒服( yǔ róng fú）, fur-lined shoes 毛衬里皮鞋 (máo chèn lǐ pí xié）, thermals （保暖衣 bǎo nuǎn yī）and warm accessories in the one-checked-bag allowed on domestic flights 航 班( háng bān）and trains 火车(huǒ chē）. Booking air travel, hotels and restaurants is a need. Planning ahead 提前计划 (tí qián jì huà）for trains is limited, however, as tickets don’t go on sale 打折(dǎ zhé）at train stations, agent booths or online 网上(wǎng shàng）until 12 days in advance of departure. Every train ticket in China must have a matching valid ID 有效身份证 (yǒu xiào shēn fèn zhèng）that each passenger shows both when buying tickets and boarding 进站上车( jìn zhàn shàng chē）trains.You can buy tickets online at www.12306.cn, the customer service site run by China Railway Bureau. 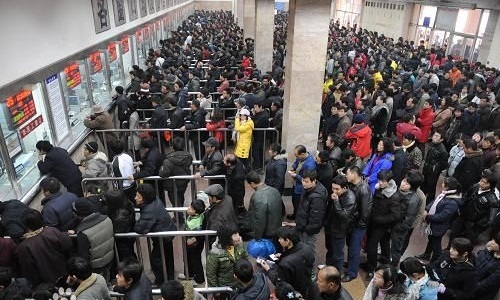 Never buy a standing train ticket 站票( zhàn piào）around the Spring Festival. The only exception is if the trip is less than four hours and during daylight hours 白天(bái tiān）. Fireworks 烟火 (yān huǒ )were meant to ward off evil spirits traditionally , but now it seems to be a way to show off one’s disposable income. Most small restaurants 餐馆( cān guǎn）in China will be shut 关闭( guān bì）at least between the Lunar New Year’s Eve 农历新年除夕(nóng lì xīn nián chú xī）and the third day of the festival, so should make sure you stock up adequate purchases for the Spring Festival. Opening hours 营业时间 (yíng yè shí jiān）of supermarkets 超市 (chāo shì）will be shortened 缩短 (suō duǎn）too. Since the locals 当地人 (dāng dì rén）will be spending time in their homes and out-of-city hometowns 家乡(jiā xiāng），the Spring Festival presents a good opportunity to tour big Chinese cities like Beijing — roads will be less trafficed and main spots 主要景点 (zhǔ yào jǐng diǎn）in the city center less crowded. Even though most migrant workers外出务工人员( wài chū wù gōng rén yuán）will be going back to their hometowns and local Beijingers will be locked inside their homes celebrating with their families, do not expect Beijing city center to be a miserable dark desert at night. Find a Chinese partner 伙伴 ( huǒ bàn）in the days before the Lunar New Year’s Eve, so that you have a chance to be introduced to the folks then and there during the Spring Festival.